Yum! 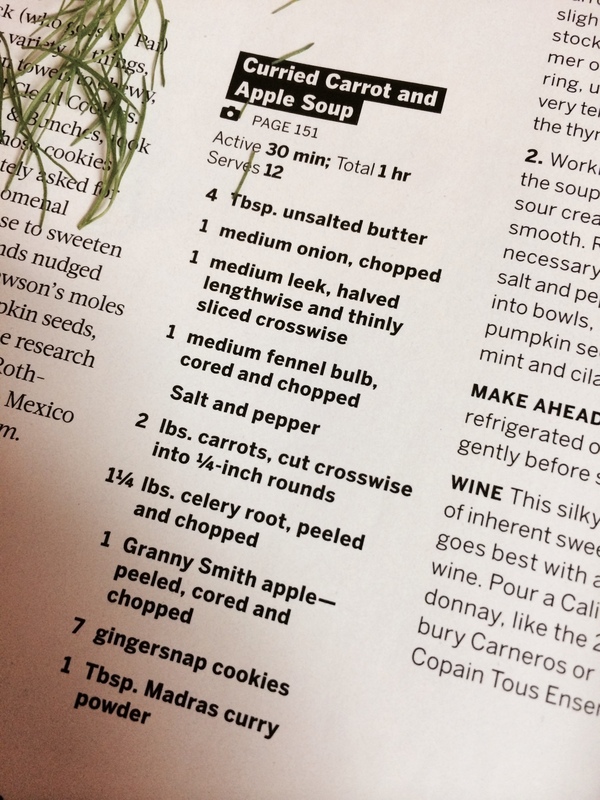 I saw this recipe in my Food & Wine magazine, by Tamalpais Star Roth-McCormick, and decided that it was perfect for a chilly day. Originally thought that I would be making it in my slow cooker, but decided to make it in my super cute green Cuisinart ceramic pot (roaster?). Honestly, I thought that the bright orange would look lovely with the green. My soup didn’t turn out as bright as I thought it would, but it was still quite wonderful! 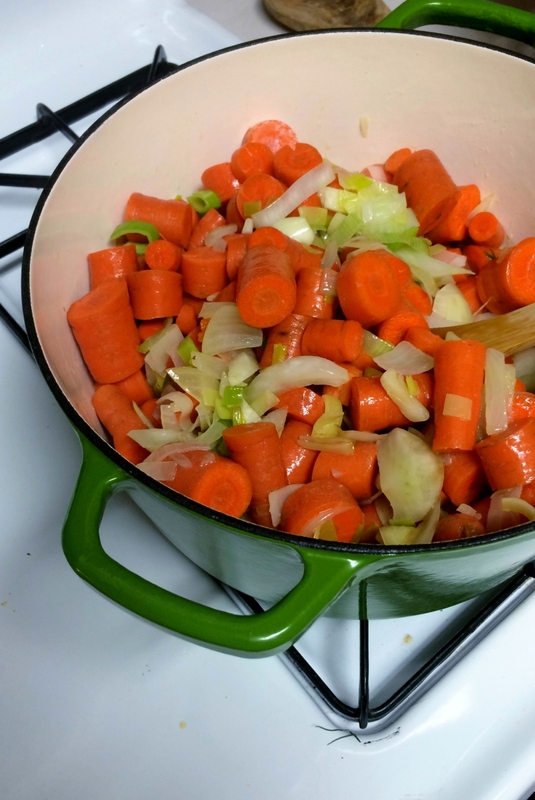 Healthier cookware…. Ryan claims to hate carrots. Yet, they are one of the cheapest and easily transportable vegetables to eat so they are a staple in our diet. He tends to get them in his lunch almost every day! This week, I thought that a soup would be fun a more creative way to sneak them into his diet. Going to the grocery store on a Sunday is always kinda crazy, let’s say that’s why I forgot my granny smith apple! Luckily, I had about a cup or so left in a frozen package of pureed butternut squash that I had used earlier. I love the Bird’s Eye brand of frozen vegetables (especially the broccoli florets and pureed butternut squash), they are often on sale at my Wegmen’s for $.99 and I stock up when I can. The apple would either add sweetness or tartness, right? So I added the squash for a bit of sweetness. 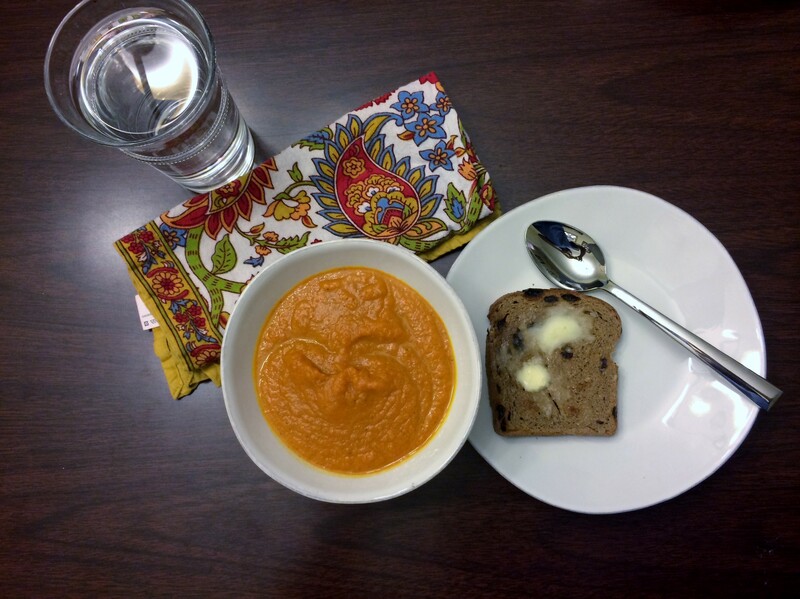 I ate the soup with a slice of Rudi’s Gluten Free Cinnamon Raisin Bread! I can’t have soup without a piece of toast, and I didn’t have any other bread. The flavor of the soup is not sweet at all; I think you could even add a bit more curry to give it a little more kick. The cinnamon raisin bread was a perfect complement. In a large saucepan, melt the butter. Add the onion, leek, fennel and a generous pinch each of salt and pepper and cook over moderately high heat, stirring occasionally, until softened and just starting to brown, 9 minutes. Chop the tops off the carrots; I didn’t worry about peeling or brushing them, just rinsed and ran my hands over them. Roughly chop them up into 1/4 inch rounds then add them to the edible colander. Tops go in the non-edible colander. Cut the tops and white bottom off the celery; place these in the non-edible colander. Roughly chop the remaining stalks and add these to our edible colander. Microwave frozen butternut squash for 3 minutes. 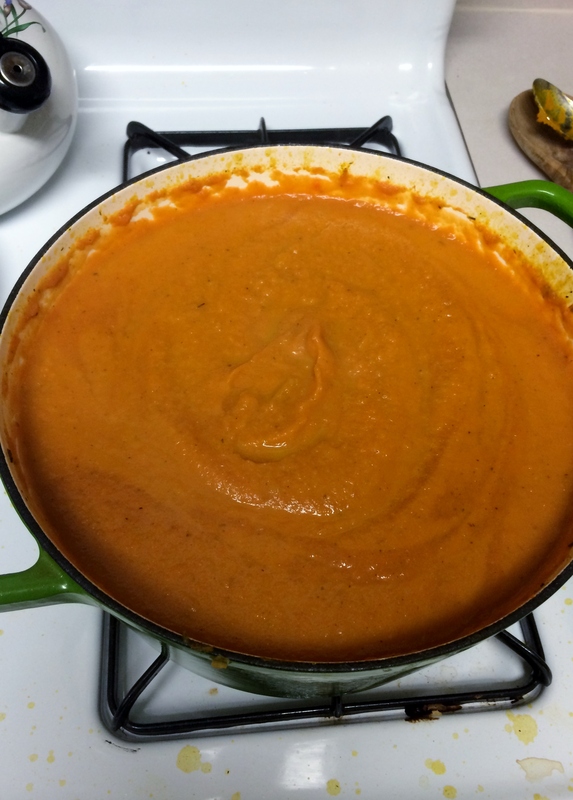 Add the carrots, celery root, squash, curry powder, garlic, ginger and thyme and cook, stirring, until the carrots and celery soften slightly, 15 minutes. Add the stock and bring to a boil. Simmer over moderate heat, stirring, until the vegetables are very tender, 25 minutes. Lower the heat and puree the soup. Using a stick blender, add the vinegar and blend until smooth. Or, work in batches and add the soup to your blender and blend under smooth. Enjoy! HEY… What are we supposed to do with all these extra non-edible pieces of crap in my other colander?